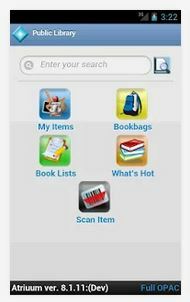 This mobile app from Atriuum gives you instant access to the Parker Public Library catalog from your favorite mobile device. Search for books, eBooks, DVDs, CDs, and more. Use your mobile device to read reviews, and even see a list of "What's Hot" at your local library. Want to know if a new release is available at your library? While you are at your favorite bookstore, use the Scan ISBN feature to capture the ISBN located on the physical item. When an item is found, the full details are displayed with the item status and availability at your library.